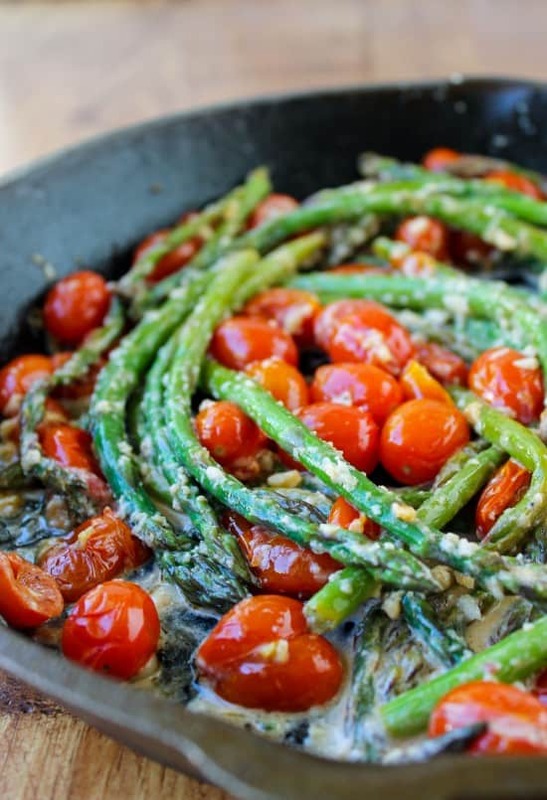 This easy asparagus recipe takes about 15 minutes to throw together. Olive oil keeps it healthy, pistachios and lemon make it memorable. The tarragon doesn’t hurt either. Perfect side dish for Easter or any holiday get-together! Today I cleaned out my diaper bag. Are you a clean car person? I feel like if you’re a clean car person then you’re also a clean diaper bag person; sadly I am neither. It took me a good 20 minutes to empty everything out, scrub it down, and return the essentials. The last thing I pulled out was from a secret pocket on the inside…a secret pocket that was so secret, I forgot it was there. I opened it up and found a bag of EASTER CANDY. It’s not new. That’s right my friends, I have been carrying around a carrot-shaped bag of Reese’s Pieces for A YEAR. Not only am I feeling pretty dirty about the fact that it’s clearly been a year since I did a full diaper bag sweep, but I can think of about a hundred diaper-bag situations where a bag of Reese’s Pieces would have been a welcome respite indeed. Are you an asparagus person? I was on the phone with my mom yesterday planning our Easter menu. She was at Costco, asking me what to get. We went through ham, potatoes, dessert, and finally–veggies. She said “broccoli,” I said “asparagus”. Why would we ruin Easter with broccoli, I said. Easter is a special occasion, ergo, asparagus. 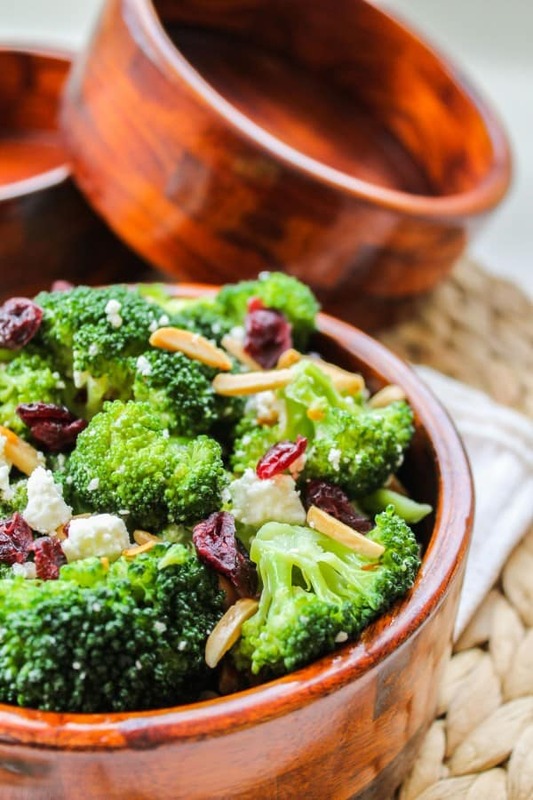 Broccoli is like what you eat when you’re just interested in ingesting nutrients to keep yourself alive. I know, I’m probably going to get a lot of resistance here. But I’m sticking with the facts here. Asparagus > Broccoli. Especially when that asparagus is smothered with lemon and tarragon. Have you tried tarragon? It’s fabulous. I first discovered it in this pasta salad recipe and fell in love. (Don’t let the crappy photos fool you. That pasta salad is LEGIT my friends.) 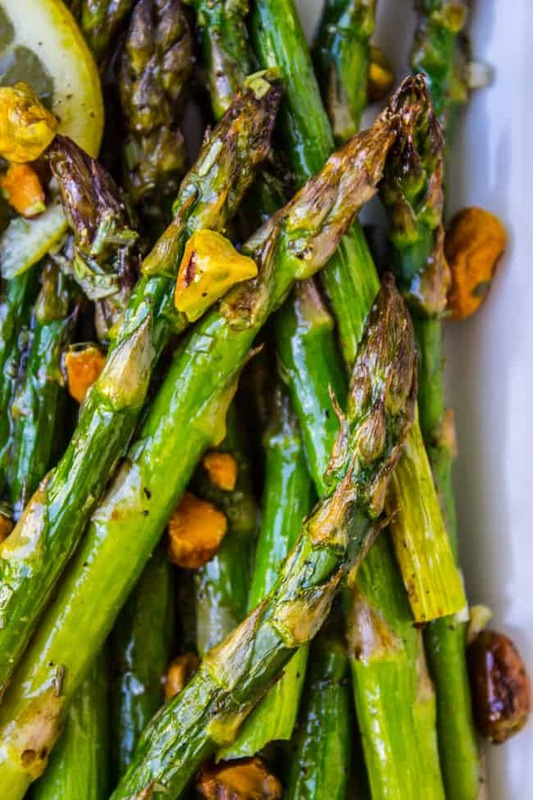 Anyway, this asparagus is super quick and packs a flavorful punch. I love it! Plus, pistachios. I mean, come on. 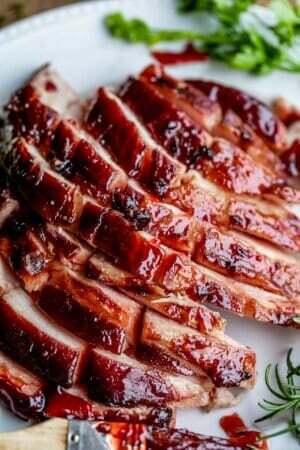 Have you planned out your Easter menu yet? 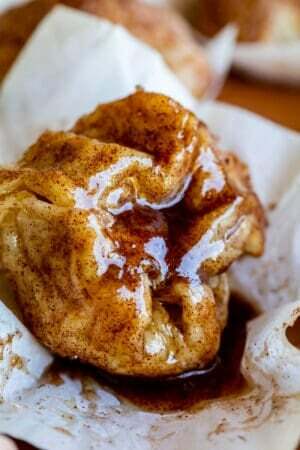 I added a menu item up there at the top of my blog called “Easter Recipes.” It takes you to a catalogue of all the recipes I thought you could use for an Easter brunch or dinner. I hope you find it useful! 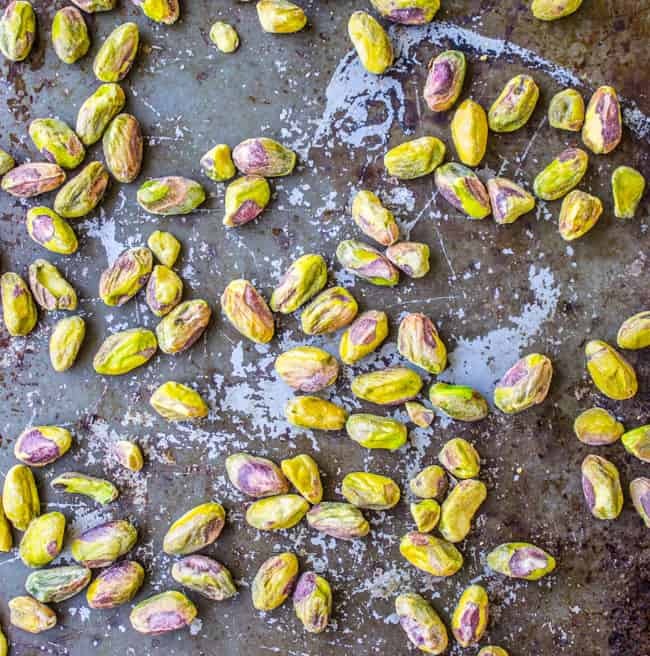 Spread the shelled pistachios on a baking sheet. Bake at 350 for about 4-7 minutes, or until toasted and fragrant. Keep an eye on them so they don't burn. Remove from the oven and immediately remove to a plate or bowl, and set aside. You can chop them or leave them whole. Wash the asparagus and snap the woody ends off. Spread in a single layer over 1 large or 2 small baking sheets. Make sure they are not overlapping a ton, or they will steam, and we want them to get roasted. Drizzle with 1-3 teaspoons olive oil and use your hands to make sure the spears are coated. Sprinkle with salt and pepper. 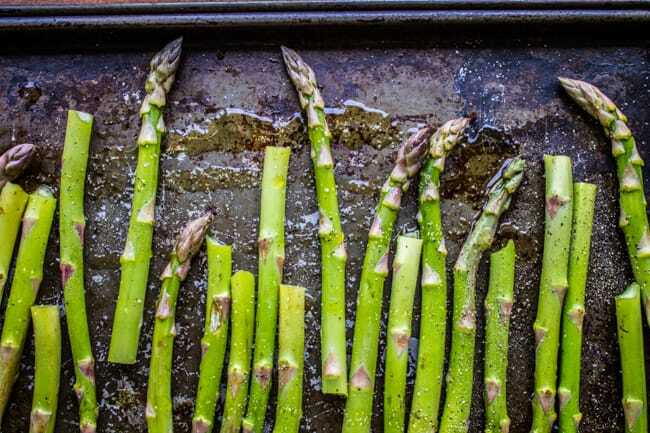 Roast in the oven at 400 for 8-10 minutes, depending on the thickness of your asparagus. If they are easily speared with a fork, they are done. Meanwhile, in a small bowl whisk together the lemon juice, garlic, tarragon, 1/2 teaspoon salt, and 1/4 teaspoon pepper. Whisking constantly, drizzle in the olive oil. 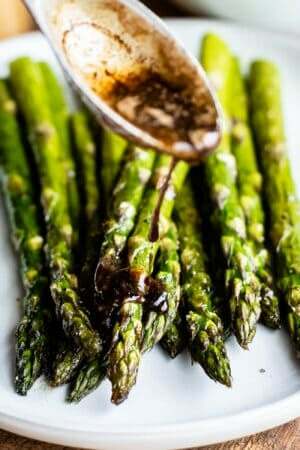 Plate the asparagus, drizzle with the dressing, and sprinkle with the pistachios (chopped or whole). Serve immediately. 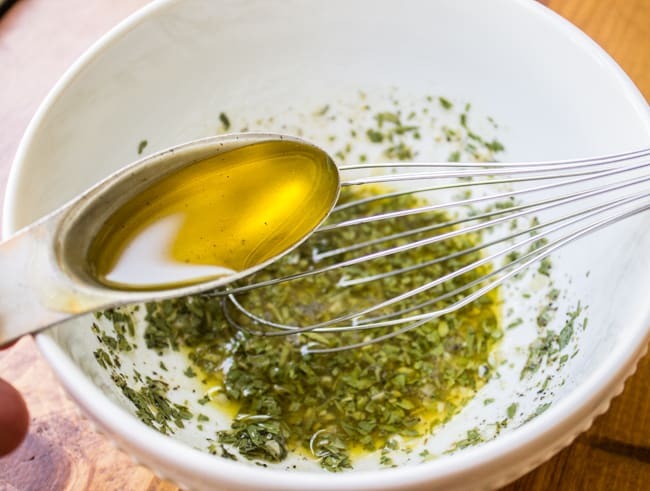 *If you don't have tarragon, oregano or basil would make tasty substitutes! 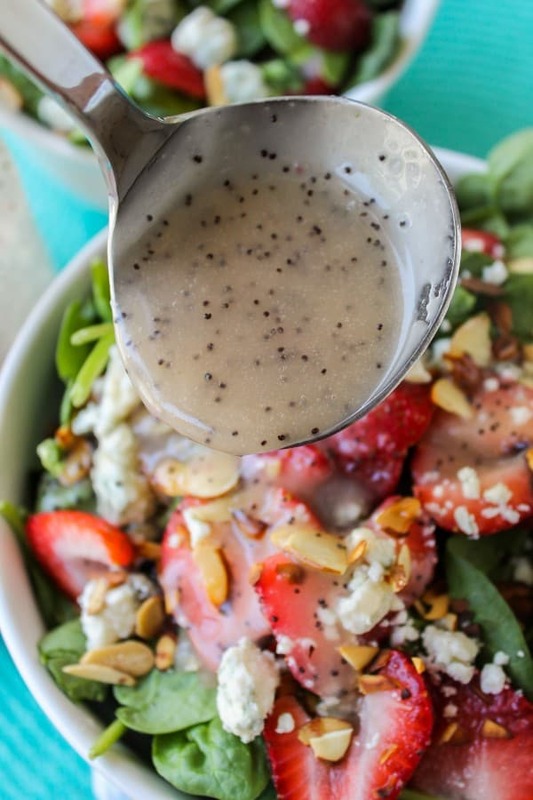 Make sure you whisk WHILE you drizzle in the olive oil so that the dressing emulsifies. Other Easter side dishes you might like! 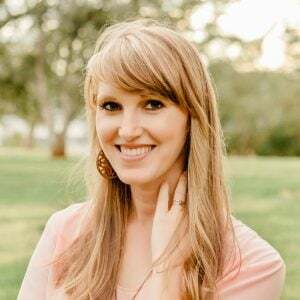 More sides from other bloggers! What a lovely post. 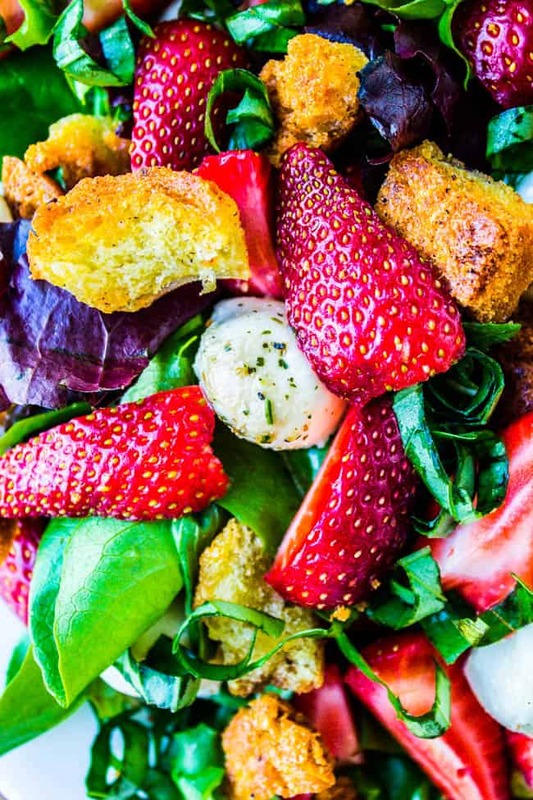 This side dish looks gorgeous Karen. 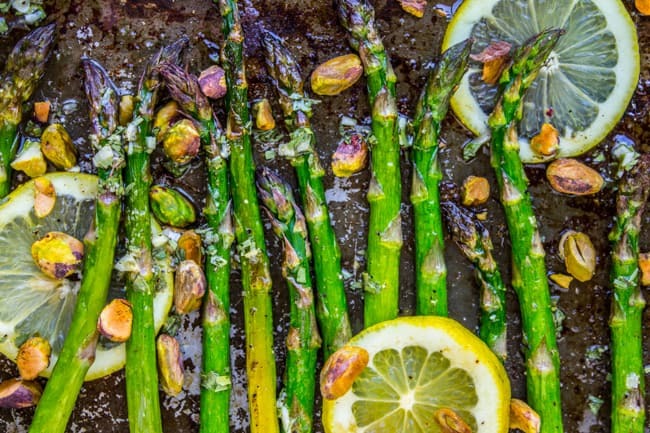 The recipe Lemon Asparagus with Pistachios sounds so tempting. The idea of adding pistachios instead of the typical pine nuts is fab and creative. I feel the flavour of this dish will be better with the combination of Asparagus and Pistachios. 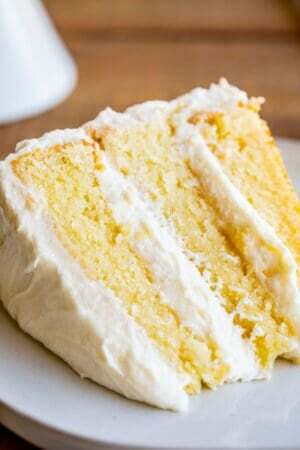 Without wasting any more time, will go and try out this recipe myself. Keep posting and keep sharing.. Thank you Evelyn! I’ve never tried it with pine nuts, that sounds fabulous too. I hope you enjoy the asparagus! I love asparagus! The recipe seems really great! Thanks for sharing! I can’t wait to try it! Awesome Beatrice! Let me know how it goes! Can I use another kind of oil? Hi Diandra! Olive oil has the best flavor I think. What other kind of oil were you thinking? Karen these asparagus look out of this world!! Oh btw I am a dirty purse/diaper bag person, but a clean car person. Weird huh? Happy Easter friend! Gorgeous side dish, Karen! I love recipes for veggies since they can often be so blah on their own. 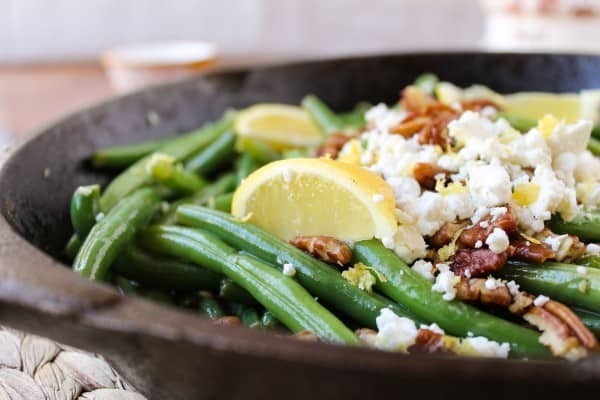 This looks delish, and i love the idea of adding pistachios instead of the typical pine nuts and whatnot. Just beautiful Karen! I love lemon and asparagus together and with pistachios? Fuggetaboutit! Hahaha – the same thing happens when I clean out Lucas’s backpacks. You know what he does? He keeps MULTIPLE backpacks and when one gets too messy he just switches to a new one….And then I find months-old dirty tupperware in the old ones. TMI? And I do love asparagus! And with pistachios? Even better. 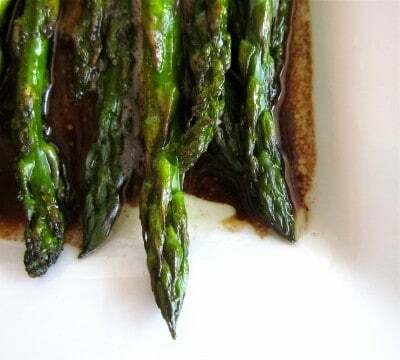 This asparagus looks incredible. I mean, like beyond legit. I agree that Asparagus > Broccoli, but Broccoli cheese anything is probably one of my favorite combinations, ever. 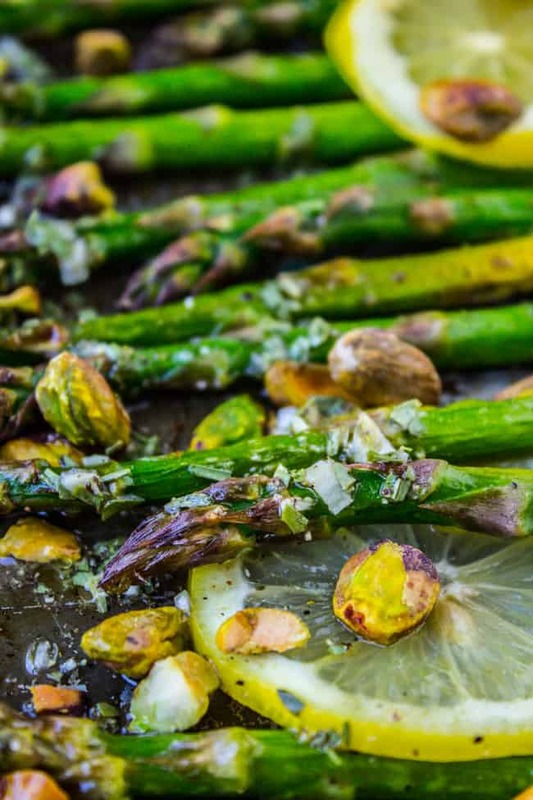 Easter candy, asparagus, pistachios and an Easter meditation….you nailed it! Thanks for the great recipe Karen. He is risen indeed! Love asparagus. Love tarragon. Love pistachios. Love this. And while I don’t have a diaper bag, I imagine when I do it will be similar to yours. I can’t even keep my purse organized now! This year I’m spending Easter in a minivan with three kids five and under. NEXT year I’m making a fancy Easter dinner complete with that magic you have pictured above. Love the round lemon slices, so impressive looking! Oh, man. And asparagus > than every other green veggie. THAT’S what I’m trying to tell everyone in this house who complain that I serve too much asparagus. Can I even describe how perfect this looks with those gorgeous pistachios?! Drooooooling here! Oh yeah for free candy. Ha ha. Love these asparagus. I make mine with pistachios and lemon too. The best. And the tarragon – never would have thought of that. Can’t wait to try it out! My car is usually disgusting. My diaper bag is an old backpack with a strap missing. So there you go. Oh, and I’d have no problem eating year-old candy if that were the only option. Judge me. Love this asparagus! 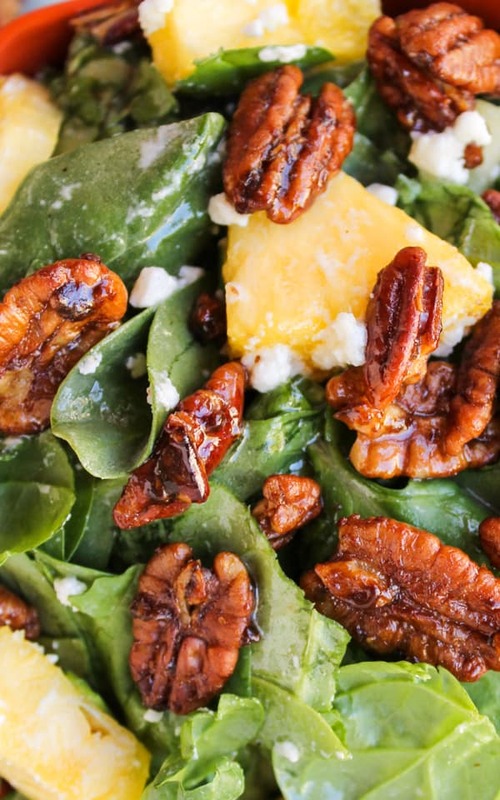 Pistachios make everything better. And tarragon is such a happy herb!